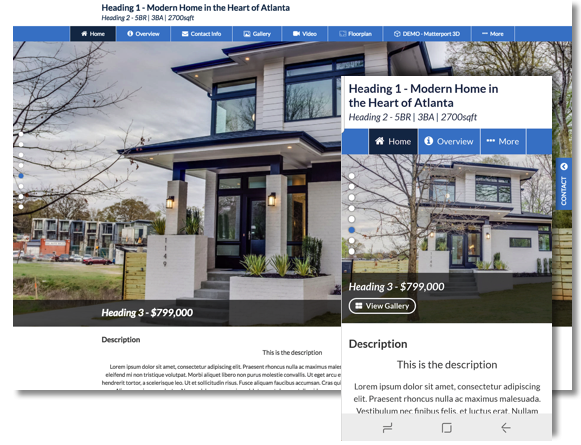 Crisp is one of our single property web experiences that allows you to market a property with a website look and feel while separating your different media types for individual attention. It provides a modern, sleek, single property marketing website experience. We understand the modern home buyer needs more than stimulating images to drive interest in the home. Other factors, such as schools and businesses within walking distance, are an example of how integration between data and beautiful imagery can deliver value. Crisp seamlessly blends these needs together in an easy to consume presentation that is responsive and mobile friendly. This can be anything you’d like. For example, if you needed to create a new Crisp option to reflect the colors of Keller William, you can set the nickname to “Crisp [Keller Williams]” to make it easily stand out. This design provides several color customization options to create designs unique to you and your clients. You can find out more on how to utilize these settings here. 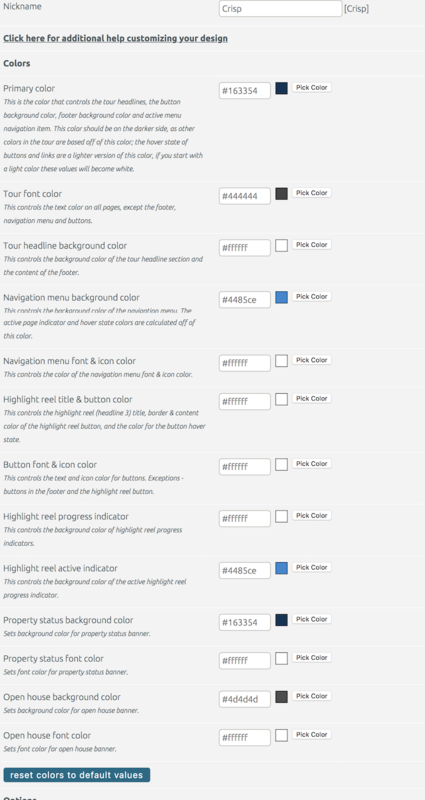 This setting defines what font will be reflected throughout the single property website. This setting defines how the property and contact information appears in the tour. Multi-tab: The Overview (property information, such as description, flyers, schools, etc.) as well as the contact information are split into separate menu tabs. The Highlight Reel is designed to showcase the top 8, 12 or all images of the property with full image gallery available in the Gallery menu tab. By default, this is set to display the first 12 images/videos. To turn this setting “off”, simply change this to display 1 image. 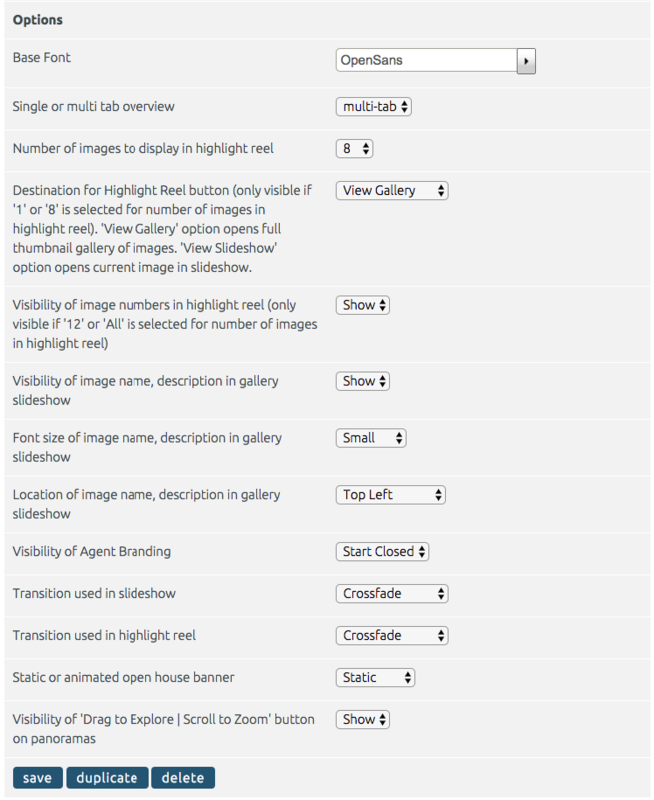 This setting lets you define whether the button within the highlight reel will bring your viewers to the Image Gallery or directly to the slideshow. View Slideshow: brings viewer to the slideshow, starting with the current image displayed within the highlight reel. This setting allows you to define where the Agent Branding appears within the tour. Start Closed: the contact fly-out on the right will remain closed and require viewer interaction to open. This setting will allow you to choose whether the open house banner is static at the top of the design, or flashes every few seconds. Show / Hide panorama dialog box.